First thought for the Ray Harryhausen issue of 'Weng's Chop' was to just cram in as many of the Harryhausen creatures as possible but I'd just done one like that for the forthcoming 'Jungle' special. 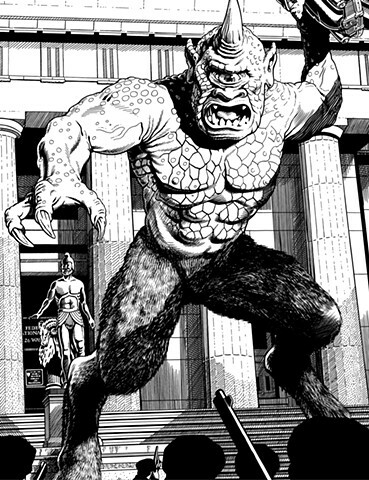 So I went with combining one of his mythological beasts with a setting from his contemporary monster movies, here the Cyclops from THE 7th VOYAGE OF SINBAD (1958) and Federal Hall as visited by the Rhedosaurus in THE BEAST FROM 20000 FATHOMS (1953). George Washington's statue is swapped for Talos and the Golden Fleece from JASON & THE ARGONAUTS (1963).